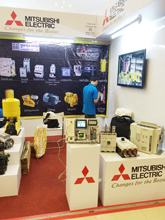 In collaboration with our Cambodian agency DHINIMEX, we operated a booth at the CAMBUILD '16 / CAMENERGY '16 Convention held in Phnom Penh for three days between September 8 and 10, where we exhibited power distribution products (circuit breakers, contactors, and motor starters) by Mitsubishi Electric Corporation; FA (Factory Automation)-related products (PLC, inverters, and graphic operation terminal [GOT]) also by Mitsubishi Electric Corporation; and general purpose motors, water pumps, and watt-hour meters by MEATH (Mitsubishi Electric Automation [Thailand] Co., Ltd.). CAMBUILD '16 / CAMENERGY '16 represents Cambodia’s largest convention for building, construction and power distribution products and is held in combination with other conventions (CAMWATER '16, CAMSECURITY & FIRE '16, CIVAR '16). Approximately 350 companies from more than 30 nations operated booths, and it was attended by more than 8,000 visitors. Cambodia’s economy is currently growing at approximately 7% per year. In addition, the construction industry, which centers around the construction of buildings within the country, achieved a growth rate of 36% in 2014. 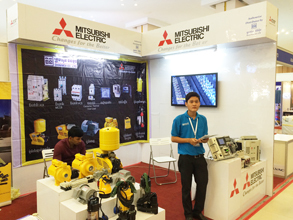 The Cambodian government is currently active in investing in the country’s infrastructure, all of which allowed us to carry out PR targeting these industries with regard to power distribution and FA-related products by Mitsubishi Electric Corporation. * Held at the DIECC (The Diamond Island Exhibition & Convention Centre) in Phnom Penh. 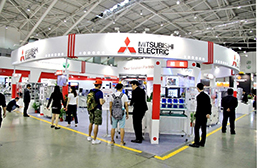 On August 2016, in the above exhibition both held in Taipei, we Setsuyo Enterprise Co., Ltd. presented FA-related products featuring the promotion of “Mitsubishi Electric e-F@ctory”, as a solution for “Smart Manufacturing ”Taiwanese government is now promoting. Monitech Taiwan 2016 is exhibition for monitoring, monitoring products and remote control technology and these related products, jointly exhibited with “Touch Taiwan”(Touch panel and Optical film exhibition) from this year, and we introduced products featuring next-generation technology and manufacturing equipment. Around 350 companies attended Taipei International Industrial Automation Exhibition. With “Smart Manufacturing Initiative”and“Taiwan Productivity 4.0 Initiative”as the main theme, robots, automation equipment, and other latest automation-related products were presented in the exhibit and this exhibition became a huge success. On the both exhibitions, we introduced FA solutions (AC servo, inverters, graphic operation terminal (GOT), industrial robots and its related partner products) through a joint exhibit with Mitsubishi Electric Taiwan Co., Ltd. Providing a clear and detailed presentation by fully utilizing the catalog and demo equipment, we received positive feedback from our main distributors. 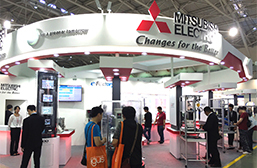 Through both exhibitions, we had the opportunity to promote Mitsubishi Electric FA-related products and service systems to many Taiwan-based manufacturers in the LCD, EMS companies, and robot industries. Our group operated a booth featuring our UV-LEDs and related products at the OPIE ’16 exhibition for infrared and ultraviolet technologies held at the PACIFICO Yokohama conference center in Yokohama in May 2016. This exhibition represents Japan’s largest international exhibition for optic and photonic products. A total of 335 companies and organizations operated booths at this well-attended event. This was the third time that Setsuyo Astec has operated a booth at this exhibition, and this year’s booth was jointly-run with a Taiwanese UV-LED package manufacturer, High Power Lighting Corp. We introduced UV-LEDs and related products that were used in industrial printing and for hardening resin, etc. Providing easy-to-understand product explanations based on catalogs and demonstration units, the booth was highly acclaimed by representatives from LED irradiation unit manufacturers from Japan and other countries, as well as other visitors to the event. The high levels of interest shown by the many visitors to the event in UV-LED and related products manufactured by High Power Lighting Corp. indicated that the exhibition was successful in allowing us to achieve a very favorable response. The call for change to LED from conventional UV lamps incorporating mercury gathers more steam every day, and it is our intention to continue with our sales activities into the future based on our slogan of “Improving Customer Satisfaction”. 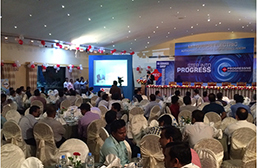 SETSUYO ASTEC CORPORATION　/　SETSUYO ENTERPRISE CO., LTD.
Progressive Engineering Corporation (Progressive), Setsuyo’s distributor in Bangladesh, held an opening ceremony on April 6, 2016 for the country’s first FA (Factory Automation) service shop that would deliver after-sales service for Mitsubishi Electric FA equipment in its Dhaka office. 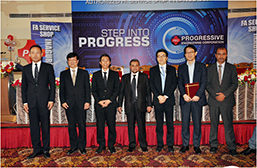 The event was a grand celebration, graced by 120 people from Setsuyo, Progressive, Mitsubishi Electric Corporation, Mitsubishi Electric India, Mitsubishi Corporation and their local Mitsubishi Electric FA clients. Established in 1988, Progressive has begun selling Mitsubishi Electric power distribution equipment in 1989, and then its FA equipment in 2001. With the increasing importance of after-sales service, the company is committed to establishing this FA service shop.